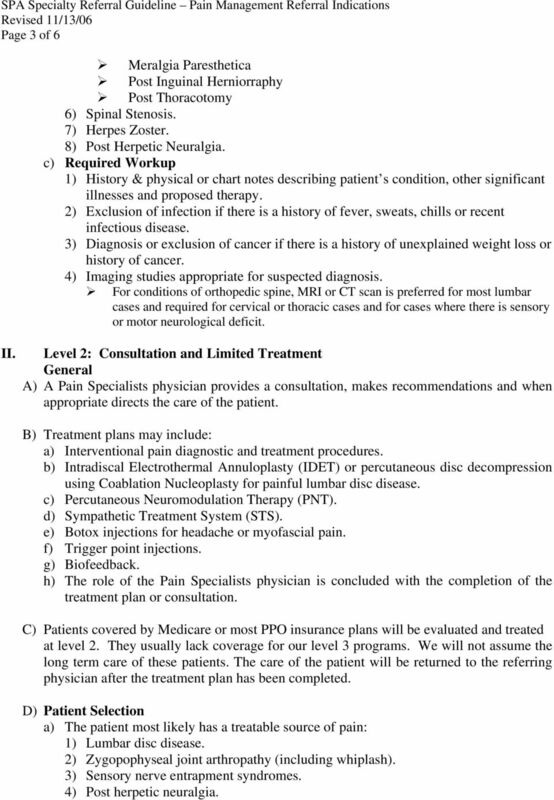 Download "SPA PCP Treatment & Referral Guidelines Pain Management Developed June 1, 2003 Revised - (Format Revisions) November 13, 2006"
2 Page 2 of 6 Patients with pain may be referred to Pain Specialists, A Medical Corporation, to receive one or more levels of care. This provides guidelines for a referral to an appropriate starting level of care. The three defined levels of care are: A) Diagnostic and Therapeutic Injections B) Consultation and Limited Treatment C) Medically supported multidisciplinary behavioral program. I. Level 1: Diagnostic and Therapeutic Injections: General A) The care of the patient remains under the direction of the referring physician. B) Patients are referred directly to the Pain Diagnostic and Treatment Center and do not require a pre-procedure office consult. C) The Pain Specialists physician verifies that the requested procedure is appropriate and safe for the patient. D) Common procedures include: a) Epidural steroid injections to all regions of the spine. b) Sympathetic blocks for diagnosis and treatment of CRPS. c) Zygopophyseal (facet) joint evaluations. d) Radiofrequency medial branch neurotomy for painful cervical and lumbar zygopophyseal joints. e) Pulsed radiofrequency treatment of dorsal root ganglion for nerve entrapment syndromes. f) Cervical and lumbar discography. 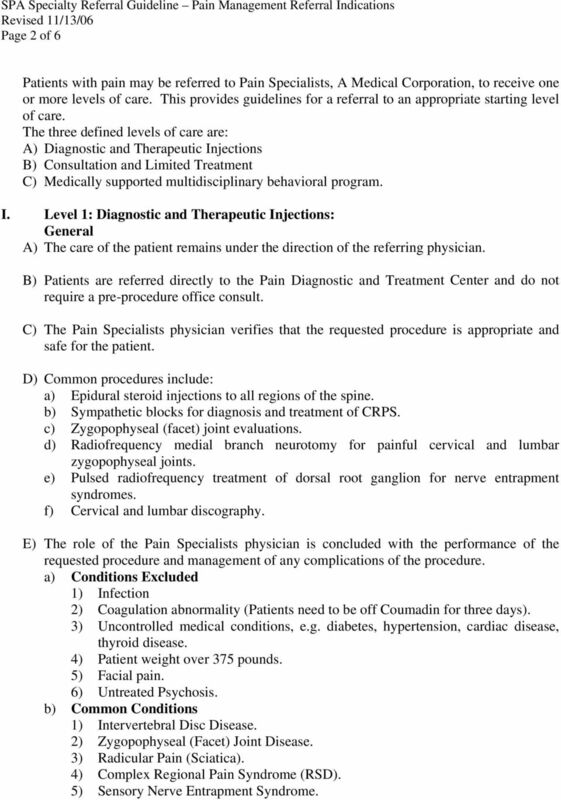 E) The role of the Pain Specialists physician is concluded with the performance of the requested procedure and management of any complications of the procedure. a) Conditions Excluded 1) Infection 2) Coagulation abnormality (Patients need to be off Coumadin for three days). 3) Uncontrolled medical conditions, e.g. diabetes, hypertension, cardiac disease, thyroid disease. 4) Patient weight over 375 pounds. 5) Facial pain. 6) Untreated Psychosis. b) Common Conditions 1) Intervertebral Disc Disease. 2) Zygopophyseal (Facet) Joint Disease. 3) Radicular Pain (Sciatica). 4) Complex Regional Pain Syndrome (RSD). 5) Sensory Nerve Entrapment Syndrome. 3 Page 3 of 6 II. Meralgia Paresthetica Post Inguinal Herniorraphy Post Thoracotomy 6) Spinal Stenosis. 7) Herpes Zoster. 8) Post Herpetic Neuralgia. c) Required Workup 1) History & physical or chart notes describing patient s condition, other significant illnesses and proposed therapy. 2) Exclusion of infection if there is a history of fever, sweats, chills or recent infectious disease. 3) Diagnosis or exclusion of cancer if there is a history of unexplained weight loss or history of cancer. 4) Imaging studies appropriate for suspected diagnosis. For conditions of orthopedic spine, MRI or CT scan is preferred for most lumbar cases and required for cervical or thoracic cases and for cases where there is sensory or motor neurological deficit. Level 2: Consultation and Limited Treatment General A) A Pain Specialists physician provides a consultation, makes recommendations and when appropriate directs the care of the patient. B) Treatment plans may include: a) Interventional pain diagnostic and treatment procedures. b) Intradiscal Electrothermal Annuloplasty (IDET) or percutaneous disc decompression using Coablation Nucleoplasty for painful lumbar disc disease. c) Percutaneous Neuromodulation Therapy (PNT). d) Sympathetic Treatment System (STS). e) Botox injections for headache or myofascial pain. f) Trigger point injections. g) Biofeedback. 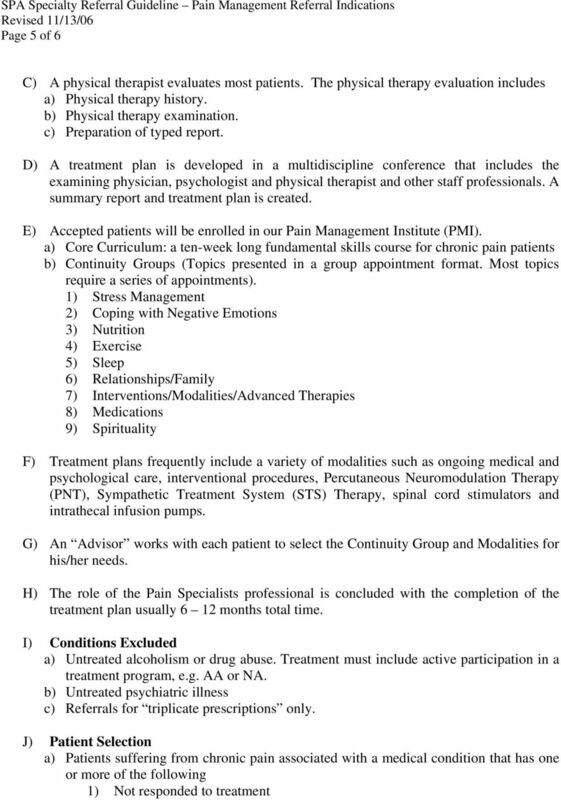 h) The role of the Pain Specialists physician is concluded with the completion of the treatment plan or consultation. C) Patients covered by Medicare or most PPO insurance plans will be evaluated and treated at level 2. They usually lack coverage for our level 3 programs. We will not assume the long term care of these patients. The care of the patient will be returned to the referring physician after the treatment plan has been completed. D) Patient Selection a) The patient most likely has a treatable source of pain: 1) Lumbar disc disease. 2) Zygopophyseal joint arthropathy (including whiplash). 3) Sensory nerve entrapment syndromes. 4) Post herpetic neuralgia. 4 Page 4 of 6 5) Complex regional pain syndrome (RSD) of less than 6 months duration. 6) The referring physician requests the Pain Specialist physician determine the treatment options or level of pain care needed when the pain diagnosis is established. 7) The referring physician requests the Pain Specialist physician provide diagnostic consultation for: 8) Pain of spinal origin. 9) Complex regional pain syndrome (RSD). 10) Headache. 11) Sensory Nerve Entrapment Syndromes. b) Patients who need pain management while being worked up by the referring physician or specialist for a medical condition, e.g. cancer pain, pelvic pain, abdominal pain. E) Conditions Excluded a) Untreated alcoholism or drug abuse. Treatment must include active participation in a treatment program, e.g. AA or NA. b) Untreated psychiatric illness. c) Referrals for triplicate prescriptions only. d) Fibromyalgia (Must be referred for Level 3). e) Abdominal pain (Must be referred for Level 3). f) Pelvic pain (Must be referred for Level 3). g) Chronic Headache (Must be referred for Level 3). F) Workup Required a) History and Physical Examination. b) Lab, Imaging & Other Diagnostic Studies Appropriate for Diagnosis. 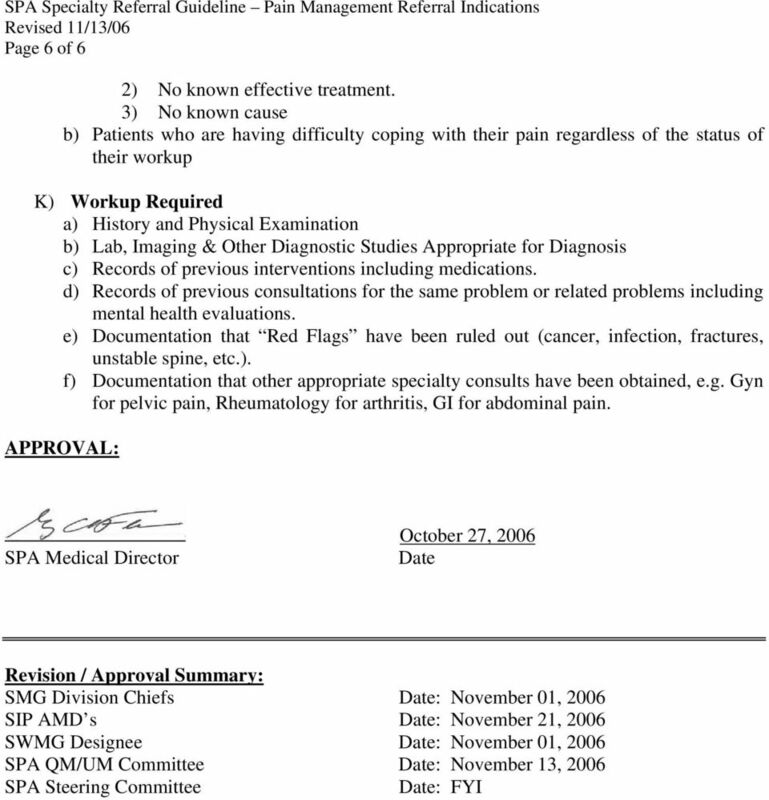 c) Records of previous interventions including medications. d) Records of previous consultations for the same problem or related problems including mental health evaluations. e) Documentation that Red Flags (cancer, infection, fractures, unstable spine, etc.) have been ruled out. III. 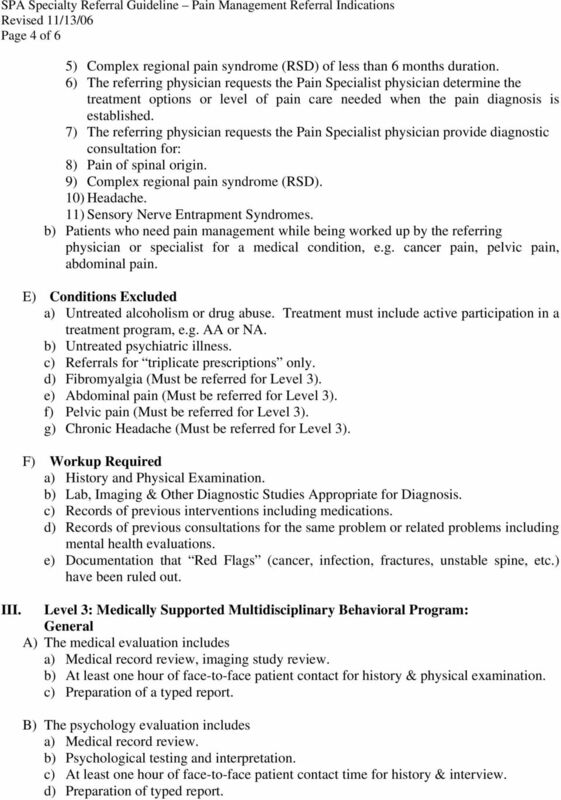 Level 3: Medically Supported Multidisciplinary Behavioral Program: General A) The medical evaluation includes a) Medical record review, imaging study review. b) At least one hour of face-to-face patient contact for history & physical examination. c) Preparation of a typed report. B) The psychology evaluation includes a) Medical record review. b) Psychological testing and interpretation. c) At least one hour of face-to-face patient contact time for history & interview. d) Preparation of typed report. IMAGING EVALUATION FOR LOW BACK PAIN. Christine Athwal, M.D. Faculty Advisor: Timothy Cobb, M.D.